The demand for speed, safety and sustainability is increasing, and so is the importance of our modular-based sealing system for cables and pipes. More and more manufacturers and contractors within rolling stock, rail control and infrastructure choose Roxtec. Our seals are classified for fire resistance, and ensure certified protection against gas, water, rodents, shocks, vibrations, noise, and electro-magnetic disturbance. Are you investing in locomotives, high speed trains, regional trains, MU's, metros, trams, city street cars or transport related infracture? 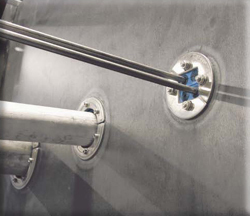 With Roxtec, you can standardize for efficiency. We offer a wide variety of customized kit solutions, worldwide support and local stock. Our solutions ensure long-term functionality, extend the life cylce for vehicles and infrastructure and include possibilities for future expansion and upgrades. All this makes us the perfect partner when you are aiming for success in international railway markets.